Sending players on a mission to save the future by killing the past, or saving the past in the future? Days of future past? 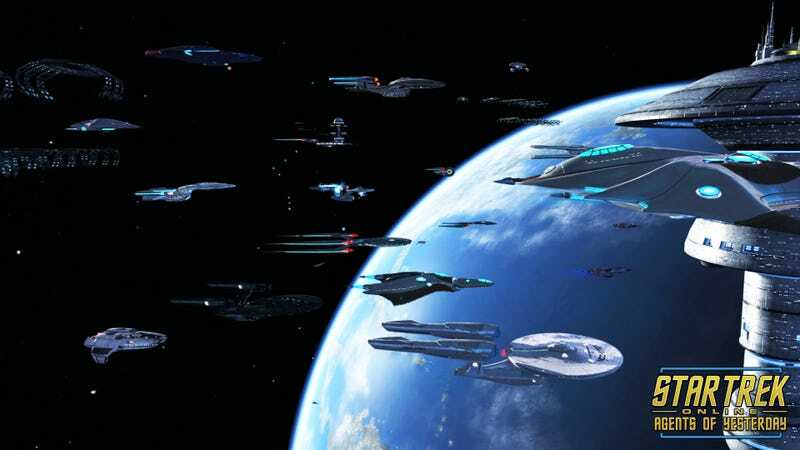 It’s all very confusing, but that’s what happened when Star Trek Online released its Agents of Yesterday expansion seven years ago. Or today. Stupid time. Bringing elements of The Original Series into the post-Voyager timeline of the massively multiplayer online game, Agents of Yesterday allows players to create their own Kirk-era captain, piloting a classic starship through classic encounters. Meanwhile, top-level characters will be recruited to become Temporal Agents in order to save the past from the future imperfect? Again, time is confusing. All I know is Crewman Daniels from Enterprise is involved, indicating that it’s been a long time, getting from there to here. New Episodes – Players can access the new tutorial section to start their journey as a Captain from Star Trek: The Original Series and experience over a dozen new missions. New Specialization Tree – After becoming a Temporal Agent, players can manipulate time to ensure the timeline is protected against those trying to destroy the past. New Special Task Force Missions – This new feature allows Captains to team up with other members of the community to take on all-new challenges in space and on ground. An All-Trek Cast – The expansion features Chekov, Daniels, and more characters straight from the TV shows and movies voiced by the original actors. The future! Or the past! Next Tuesday! What does it matter anymore? The expansion launched for PC on whatever passes for today these days. Star Trek Online is coming to the PlayStation 4 and Xbox One this fall, bringing all of this craziness with it.